A United Launch Alliance Delta 2 7320-10 will be used to launch the WISE spacecraft for NASA. 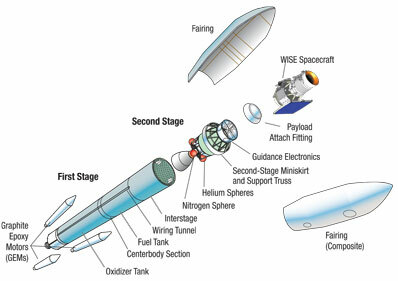 The two-stage launch vehicle has four major assemblies: the first stage, including main engine and three strap-on solid propellant rocket motors; interstage; second stage; and 10-foot diameter payload fairing. Manufactured by Pratt & Whitney Rocketdyne, the RS-27A main engine operates on liquid oxygen and RP-1 (kerosene). The RS-27A has a sea-level thrust of 200,000 pounds. Each of the Alliant Techsystems solid strap-on motors has a sea-level thrust of 100,270 pounds. The main engine and all three solid rocket motors burn at liftoff.